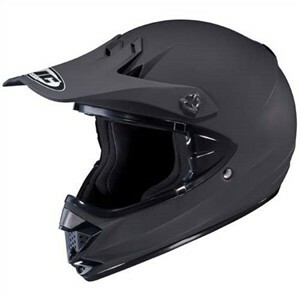 The HJC CL-X5N solid helmet is refreshing in its simplicity. This helmet doesn't pretend to be anything but a well-built off-road helmet. Rest assured, in the case of this helmet, simple does not mean low quality. The CL-X5N is both DOT and Snell approved with its advanced polycarbonate composite shell, which was designed with HJCs advanced CAD technology. The CL-X5N has a removable and washable interior. This is even more important in a dirt helmet than it is in a street helmet. That interior is made of what HJC calls "Bioceramic Nylex". It is a moisture wicking interior that is anti-bacterial. Venting is channeled through the front and pulled from the rear of the helmet. Even the color options are no-nonsense. You can get this solid HJC helmet in any color you want as long as you want white, matte black, or black. There is one downside. Even though HJC claims a large eye port, some goggles are a tight fit in this helmet. I suggest that you try on this model with your preferred goggles before purchase. I wear an HJC dirt helmet myself and can attest to the quality reputation HJC is growing in the industry.